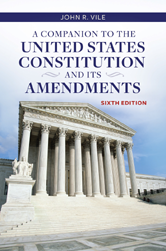 A Companion to the United States Constitution and Its Amendments incorporates numerous new developments in the four years since the previous edition, including the appointments of new Supreme Court justices, impactful cases involving First Amendment rights for students, the Affordable Care Act, National Security Agency (NSA) data gathering, voting rights, campaign finance law, DNA sampling, and the ongoing battle over gay rights. LAYER CAKE OR MARBLE CAKE? IS THE AMENDING PROCESS EXCLUSIVE? THE BILL OF RIGHTS: A FLOOR OR A CEILING? A REBIRTH OF THE DUE PROCESS CLAUSE?